Welcome to content update 2.0! Due to Uncharted’s shift in management (discussed here), we believe that our vision for Uncharted is far beyond anything that was previously established. While the features in this release do not drastically change the gameplay of Uncharted at its core, they mark the beginning of a new journey for Uncharted - which is why we feel as though this update is worthy of the “2.0” title. Also, don’t forget to check out our official trailer and our first reward opportunity! Anyways - as I said, this update does not drastically change any Uncharted’s core gameplay, however there is still a lot to discuss - so let’s jump right into it! A feature that has been under construction in Port Nolem for quite some time… After searching far and wide, the port has finally found the merchants willing to stand around all day and sell your items to other players! Shopkeepers will safely sell your items to other players, even when you are offline! Right-Click on an empty shopkeeper in Market Alley to rent a shopkeeper. You may rent a shopkeeper for up to 3 days at a time. Type /shopsell <price> while holding an item to add that item to your shop. To add more stock of an item to your shop, re-type this command while holding the same kind of item. To remove an item from your shop, simply right-click on the item in your shop’s display. Type /shoptitle <title> to change your shop’s title. Type /shopdesc <description> to change your shop’s description. You can close your shopkeeper at any time from your Shopkeeper’s settings icon. After opening a shop, you can add hours to it as long as its time does exceed 3 days. Leftover Stock safely holds the items that you did not sell whenever your shop runs out of time. Interact with any shopkeeper to claim your leftover stock. You must empty your leftover stock before renting a new shopkeeper. Buying Items is as simple as visiting an open shopkeeper and clicking on a listed item. A reward type! Voting rewards can be claimed by typing /rewards and clicking on the “Voting Rewards” icon in the bottom-left corner. These rewards can be claimed once every 24 hours, and get better as your streak gets higher (just like daily login rewards)! Claiming these rewards is as simple as visiting one of our official server listings, filling in the required fields, and sending in your vote! The server will automatically issue your rewards after seeing that you have voted for the server. Over the past few months, Port Nolem has seen some… strange things in the water. It is believed that the water in these tides has come from some sort of ancient, unknown location from the deep seas. This treasure chest is bound to have some amazing new things in store. Actually - old things… or old new things? New old things? I don’t know, let’s just see what is in this chest. Ancient Kits are a new type of kit that can ONLY be found by unlocking and searching through an Ancient Treasure Chest. ALL Ancient Kits come with an EXCLUSIVE enhancement that requires the FULL armor set to be worn in order for it to be activated. These enhancements has associated skills that can be leveled up via. the /skills menu. This kit type does not have an experience-based leveling system - it comes as-is. The Ancient Treasure Chest is a new openable that is located in spawn. The only possible contents within this openable are random Ancient Kits and random amounts of Pearls. Can only be unlocked with an Ancient Treasure Chest Key, which can be bought from the Locksmith for 2,500 Pearls. Once opened, you get to search for the Ancient Kit of your choice. You will then search for the chest and find either a random Ancient Kit or a random amount of Pearls. If you find the Ancient Kit you were searching for, you will unlock that Ancient Kit forever. If you find on an Ancient Kit that you weren’t searching for, you will get the kit that you found once. If you find a random amount of Pearls, you will get the amount of Pearls that you found in the chest. Creates tremors in the Open Seas, knocking back nearby players and giving them temporary nausea. Flap your wings, making your character double-jump so you can reach higher places without enderpearls. Time has passed, and some more previously uncharted land has since been discovered in the Open Seas! 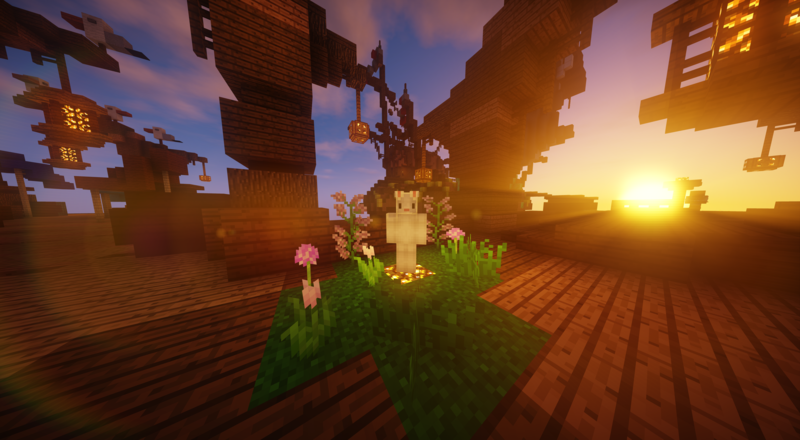 Trade Easter Eggs for exclusive items by speaking to the Easter Bunny in the docks. New hostile mobs that have taken over the Open Seas! Dropped by killing Killer Rabbits in the Open Seas. Trade these with the Egg Trader for exclusive items! Summon a horde of Killer Rabbits to help you take down foes! Treasure Chest that is GUARANTEED to contain an item from the Egg Trader. Passively spawns a group bunnies around you in no-PVP areas. Doubles the chance for Killer Rabbits to drop Easter Eggs on death. Treasure Restock Passes have been re-modeled to be “Tide Shifters”. Quest XP yields from the Wizard have been nerfed. Players will now only have to wait in the Ghost Ship for 30 seconds if they died on an island. Rank prefixes have been changed across the board. Ban messages now show more information. Skill Slot Trinkets have been removed from the shop. They are now available as a legendary item in chests. Trees on island schematics are now entirely made up of logs and leaves.